Detailed scans of concussed University of British Columbia hockey players found that the protective fatty tissue surrounding brain cell fibers was loosened two weeks after the injury—even though the athletes felt fine and were deemed ready to return to the ice. A loosening of that insulation, called myelin, slows the transmission of electrical signals between brain cells, or neurons. 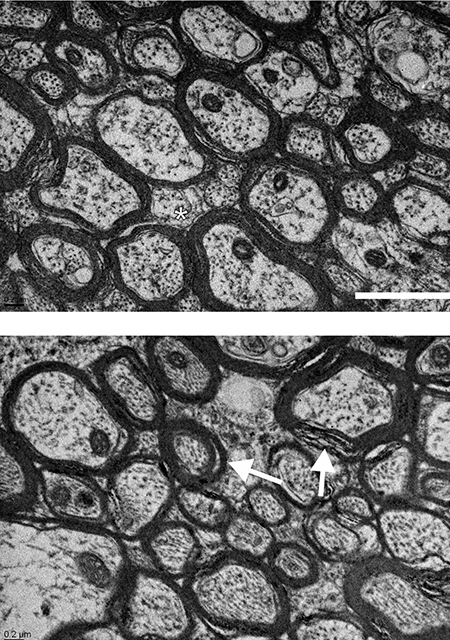 Researchers have previously shown in animals that this loosened myelin can completely deteriorate with subsequent blows—a condition that resembles the neurodegenerative disease multiple sclerosis. Published this month in Frontiers in Neurology, this is the third study arising from the unusual before-and-after study of UBC hockey players. The 45 athletes had their brains scanned with magnetic resonance imaging (MRI) before the season began; if they were concussed, they were re-scanned three days afterwards, two weeks afterwards, and two months afterwards. Eleven athletes were concussed during the season, and most of them underwent the additional MRI scans. Conventional MRI imaging—the kind done in hospitals to assess brain injury—does not reveal myelin loosening. Rauscher and postdoctoral research fellow Alex Weber used advanced digital analysis of the scans, using a UBC-developed, pixel-based statistical analysis to find changes that visual inspection could not reveal. Previous analysis of the concussed athletes’ scans, published by Dr. Rauscher in 2016, had shown changes to the myelin in the corpus callosum—the part of the brain that helps the brain’s two hemispheres communicate, and is most susceptible to damage from sudden collisions against the interior of the skull. But the researchers didn’t know whether the myelin was diminished, akin to multiple sclerosis, or altered in some other way. The good news is that it was something else—a temporary loosening around the nerve fibers that connect brain cells. When the concussed players were re-scanned two months after their concussions, their myelin had returned to normal. But Dr. Weber says the findings provide a convincing reason to keep concussed athletes on the bench even if they no longer exhibit any symptoms, as measured by a standard test of cognitive abilities, balance, coordination and mood.